That’s what I intended this post to be. 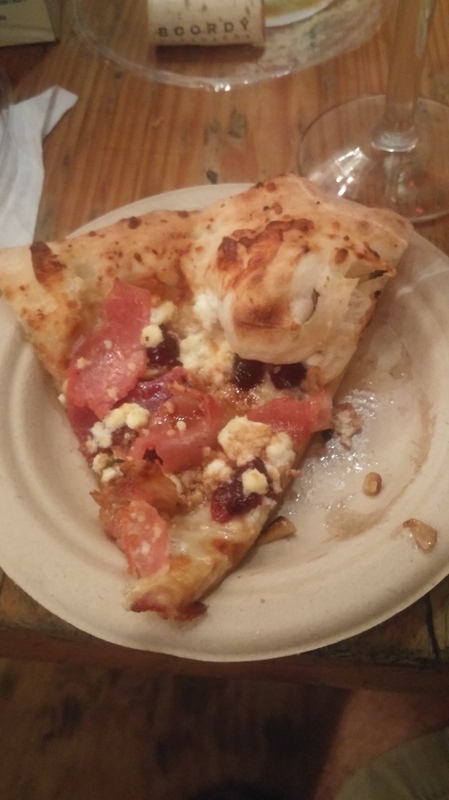 Or maybe I’m still salivating at the thought of this pie we ate last Friday. It was just that, short n’ sweet. It was decimated within minutes. Well that’s it, thanks everybody! Ha! 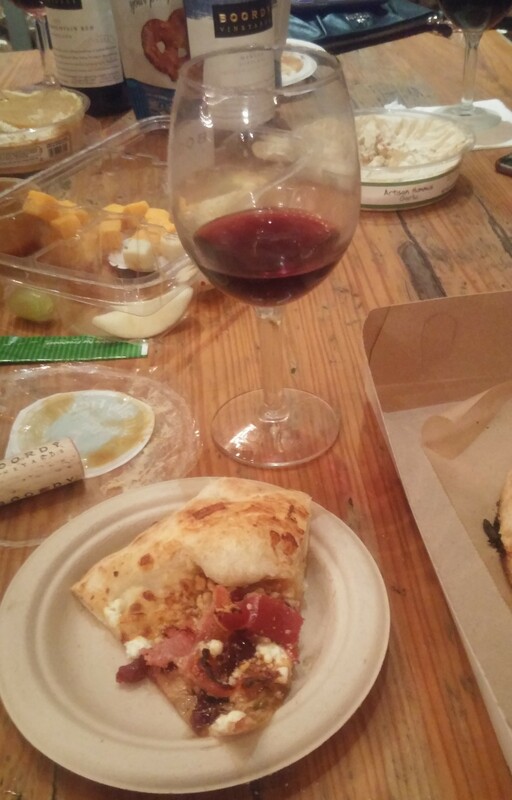 We were at a local wine club party enjoying our various snacks. 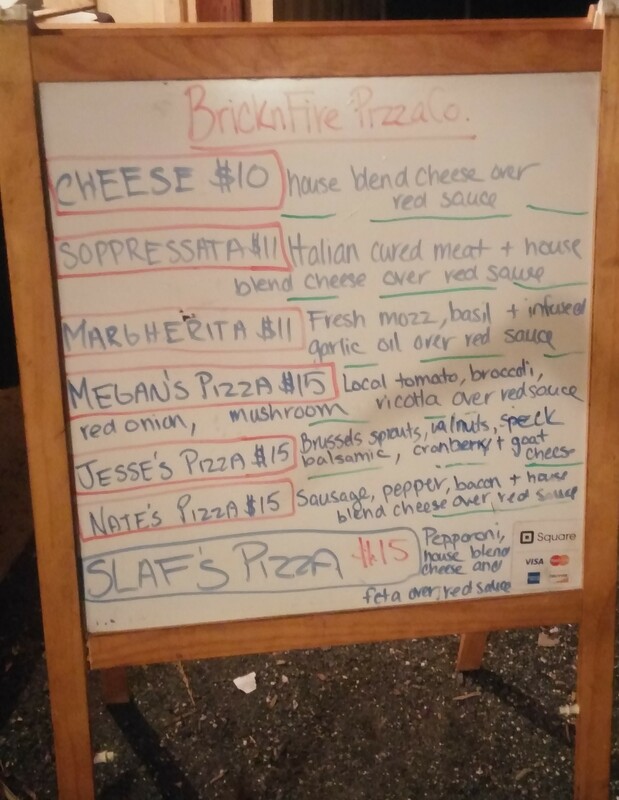 But I had another inspired thought, just like last time, to order a pizza from the highly touted and regarded, BricknFire Pizza Co. The results were incredible! I scoured their menu, or big board, as I like to call it, to find something that fit the mood. We’re fast-approaching the heart of November. A pie that would represent the spirit of the holidays was definitely in order. A bottle or so in may cloud a persons judgement but not me. I went with the ‘Jesse’ for the simple reason I saw cranberry. I felt inspired. I just had a feeling this was going to be something exceptional. Saying I was right would be an understatement. So who’s Jesse? Well he is the man. 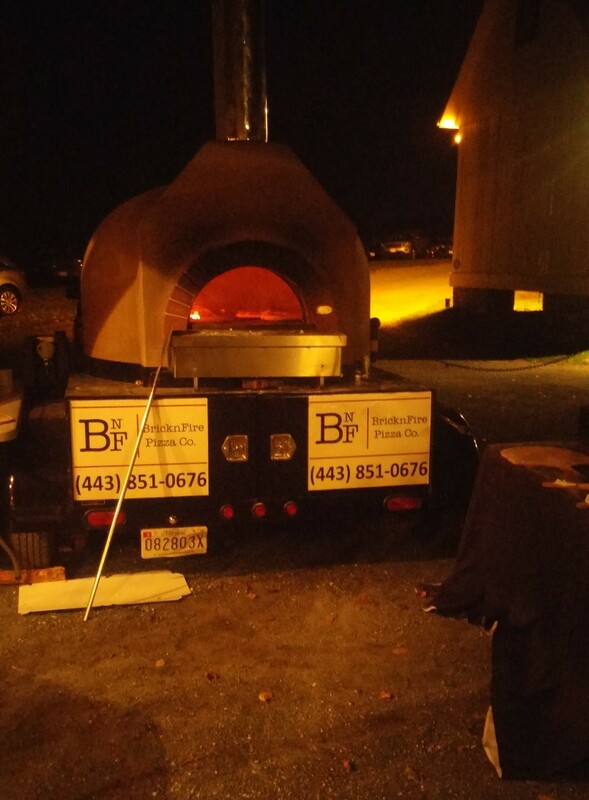 And he was the gentleman heating up everyone’s creation in that incredible looking oven. This screams passion and heart. 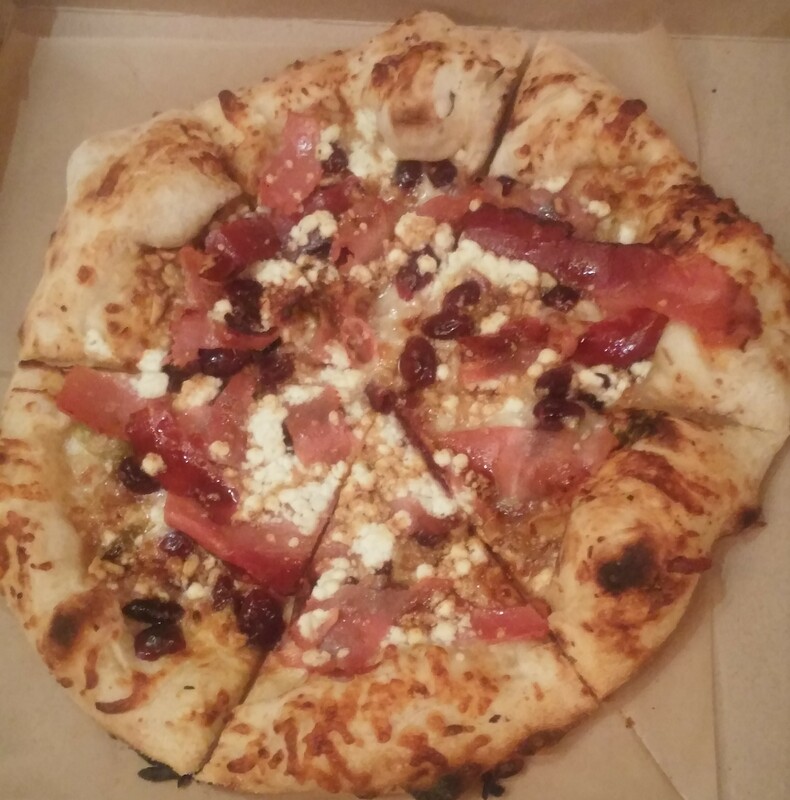 And this pizza we ate definitely came from the heart. My goodness. This was jut the perfect thing we needed while we’re a little relaxed via our red wines. We had our cheese, crackers, fruits, and other oddities, but this put out evening over-the-top. Alright I’ve used enough superlatives and vagueness, and I’ve yet to talk about the pie. Let me get to the point. The dough and crust had this perfect squishy factor to it (just right for the holidays). And for the element we’re in this was beyond perfect. We were inside a barn listening to live music in a very intimate setting. Almost any pizza pie was going to be good here. But only a few were going to be great. This goes beyond great. 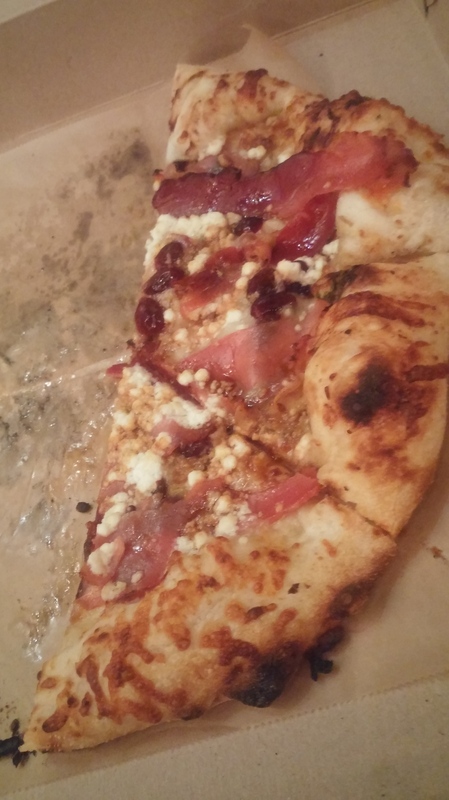 The goat cheese, walnuts, cranberry, speck, and balsamic all really shine through. And no one gets lost in the shuffle. Speck, a type of prosciutto, is not something I have frequently. And for good reason. It’s very high in fat content but it was pristine and flawless here. This whole pie was exquisite. I did not deliberately leave out the brussels sprouts, but I wanted to give credit where its due on that too. I didn’t discover them until seeing them at the very bottom of the slice. And sometimes under the cheese. This was divine. As you can see this pie never had a chance just a couple of minutes in. And it went perfect with our Merlot. My mouth is watering as I expound on this. You have got to be kidding me. This was a 5-star, pie for the ages candidate. I truly mean that. Where can I find you guys again? Well for our friends in the Baltimore area, their Facebook page keeps us up-to-date on where they’ll be. 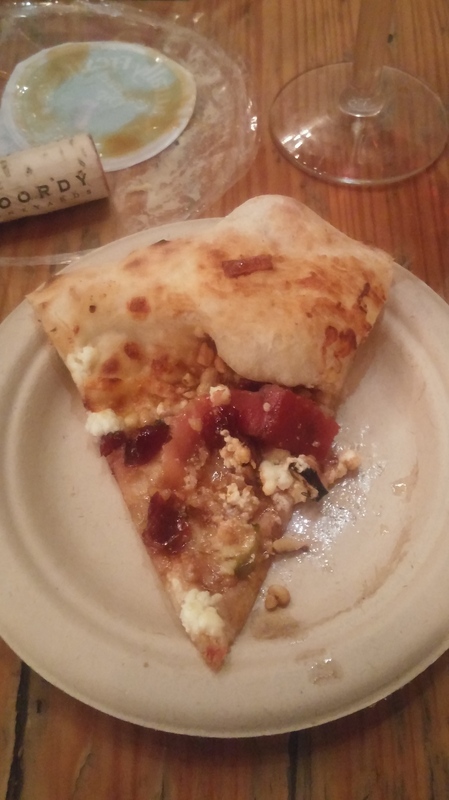 For more on the wine and party mentioned in this post, click here! Awesome post!! Now I need to go enjoy this Friday with some wine and pizza!! This must be sweet, indeed.